Editor’s note: Today we continue our series on the seven sins of consumer psychology from the presidential address of professor Michel Tuan Pham at the recent conference of the Society for Consumer Psychology. Read the introduction here. Not only are the consumer topics that we choose to examine overly restricted, but the lenses that we use to examine these topics are overly thin. In the past 40 years, most of our research has been guided by cognitive and social psychology, and behavioral decision theory. Constructs that dominate our theorizing include attention, perception, categorization, information search, inference-making, cognitive responses, memory, attitudes, choice rules, heuristics and biases, and mental accounting. This type of research has produced a rather narrow and mechanical view of the consumer: “If we do X to consumers, then process P will be triggered, and outcome Y will take place. This mechanical view of the consumer fails to capture the true richness of how consumers actually operate. 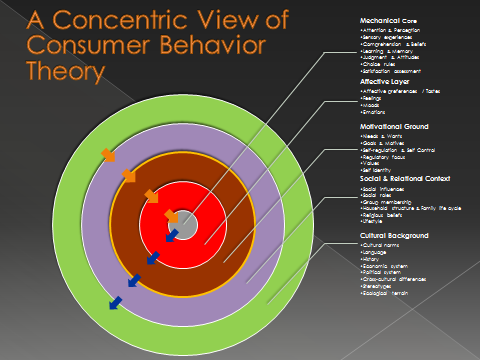 I like to think of consumer behavior theory as a series of concentric circles, each circle representing a different type of lens on consumer behavior. At the center is a mechanical core: the information processing and judgment machinery that the field has studied extensively. Outside this mechanical core is the affective layer: the feelings, moods, emotions, and affective preferences to which I have dedicated most of my research. We can think of the forces within this affective layer as shaping what happens within the mechanical core from the outside in: feelings influence judgment; mood influences memory, emotions influence time discounting, etc. Outside the affective layer is the motivational ground: this is where consumers’ goals, motives, needs, and values reside. Again, we can think of the forces within this motivational ground as shaping what happens within the affective layer, and thereby what happens within the mechanical core. For example, the goals and needs that we have dictate to a large extent the feelings and emotions that we experience, which in turns affect how we process information and make judgments. Beyond the motivational ground, we reach the boundaries of the self, which are depicted here in yellow. The self is embedded within a social and relational context, where social influences, family membership, and social roles come into play. Finally, consumption behavior takes place within a broader cultural background that is shaped by language, norms, history, economic system, etc. Evolutionary forces can be seen as contributing to this cultural background as well. As depicted in the figure, forces from the outside layers shape the inner layers (the orange arrows), and conversely, operations of within the inner layers can affect the outside layers (the blue arrows). A concentric view of consumer theory also encourages us to recognize that theories of consumer behavior are not necessarily mutually exclusive. An insidious form of the “sin of narrow lenses” in our field is an obsession with unique theoretical explanations. This obsession is often accompanied by a phenomenon that we might call “theoretical tyranny,” whereby reviewers insist that the authors differentiate their account from popular theories such as Prospect Theory, Construal Level Theory, or Regulatory Focus Theory, or re-express their findings in light of these theories. Our obsession with unique explanation may be counterproductive for several reasons. First, many important and interesting consumption phenomena—for example, the attraction effect, self-control failures, or differences between Chinese and North-Americans in terms of food preferences—are clearly multiply determined. In fact, if a phenomenon is really uniquely determined, chances are that it is not that important to begin with (a point related to another sin discussed later). Second, many theories should be seen as complementary rather than competing in that they represent different levels of explanation. For example, a given bias in mental accounting may be driven by differences in attention to gains vs. losses, which would be a cognitive explanation. However, that attention mediates this bias does not preclude the possibility that motivational forces are also at work and direct attention to begin with, which would be a complementary motivational explanation. Third, the pressure to advance unique explanations has created a perverse incentive for authors to create artificial distinctions between their work and previous work, and an unhealthy tendency to preferentially cite work from other disciplines rather than work within our own discipline. Finally, let’s not forget that theories are just theories. According to the Oxford dictionary, theories are “suppositions or systems of ideas intended to explain something” (New Oxford American Dictionary, 2010). In other words, they are not meant to be statements of categorical truth, they are only meant to provide coherence to the phenomena that we observed. Theories are just lenses that we use to internalize and generalize empirical observations about the external world. Therefore, we should be open to the co-existence of multiple theories rather than feel the constant urge to identify a single “best” theory. A good illustration is Chaiken and Trope’s (1999) edited volume titled “Dual-Process Theories in Social Psychology,” which catalogues 20 or so dual-process theories of attitudes, person perception, stereotyping, self-regulation, etc. These 20-some theories are correlated in that they are not conceptually independent and do not yield perfectly separable predictions. Yet, they are allowed to coexist, because they each provide a useful lens on the phenomenon that they were designed to explain.